Information passed down by Gladys Irene (Wren) Hart confirms that these people were ancestors of John Hart. She recorded that Mary and their children were born in Maidstone while Thomas was born in Redditch. Their son Stephen Alfred (28 May 1855 - 4 Feb 1932) married Mary Elizabeth Mobbs (29 May 1858 - 24 July 1946). Gladys also recorded that Mary Elizabeth Mobbs' father was George Mobbs from Buckingham(shire) and her mother was Betsy (Elizabeth) Withers from Midlands(?). With this information we are able to positively find these people in the census entries of Maidstone in 1861 and 1881. In the census Thomas Hart declares that he born in Redditch, Worcestershire (just south of Birmingham) in 1825-6. For some reason we do not yet know he made his way to Maidstone in Kent where he married Mary E. (for Elizabeth?) Wood. The two census entries allow us to piece together more of the family history of this couple. They produced a large number of children, some of whom have obviously produced descendents alive today with whom we may some day make contact. The census entries are shown below. In the panel on the left the children of the marriage (at least 9! ), as revealed by these census returns, are listed. The returns also hint at some of the other interesting characteristics of the family. Thomas lists himself as a carpenter. As such he may or may not have been literate. His son Stephen, however is identified as a printer compositor which would mean that Stephen was literate. It was Stephen's son Albert who later became a school headmaster and evidence of the family commitment to education is showing at this early time -- remembering that education did not become universal in England until after 1870. As is usual in the census, children attending school are referred to as scholars and we see that as early as 1861 all of the Hart children are being schooled. While Thomas and Mary are living at 136 Prospect Place with their children ranging up to age 6 or more, it is interesting to note that next door at 135 Prospect Place is a family of Woods headed by Jane Wood a widow and charwoman of age 55. As we see, looking at the 1871 census, this Wood family is the one that Mary comes from and so we see that Jane Wood born about 1806 represents an earlier generation of this line. Another interesting feature of the returns is that in 1881 the unmarried sister of Mary, Emily Wood is living with them (as opposed to visiting). She is indicated to be an "Overlooker In a Paper Mill" which means that she was in some sort of supervisory position in a work environment. One other thing of interest shows when we look at the 1881 index page. The neighbours of the Harts, in house 16 Prospect , are the Mobbs family -- the same Mobbs it turns out as mentioned by Gladys. And so Stephen Alfred married 'the girl next door'. Prospect Place, in 1881, was newly built housing that had been constructed for the railroad. It is located on the side of a hill that slopes down to the railroad and beyond that to the River Medway which flows north to the Thames estuary at Chatham. 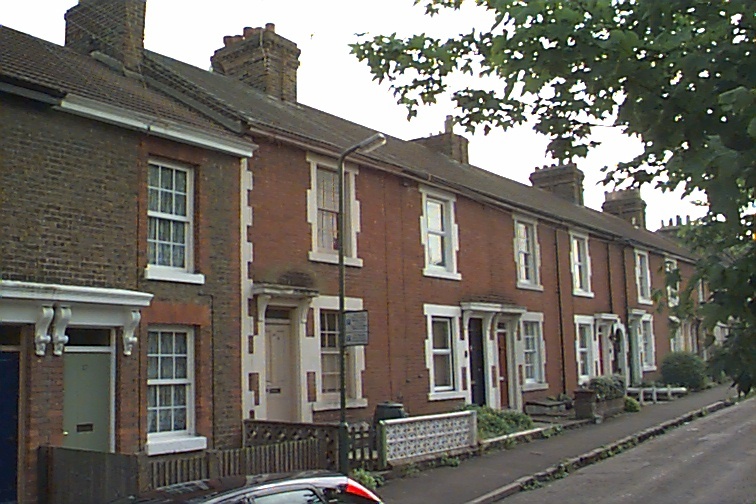 The first photo below shows the street as it looks in 1999 with a closeup of No 15 in the second photo. In the first photo Number 15 is just to the right of center next to the house with a white fence in front of it. 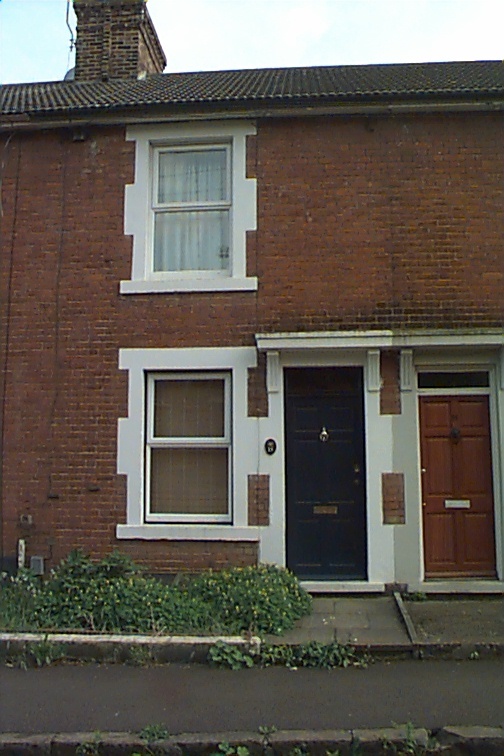 The Mobbs family were the neighbours in number 16 which is the next house to the right in the first photo.